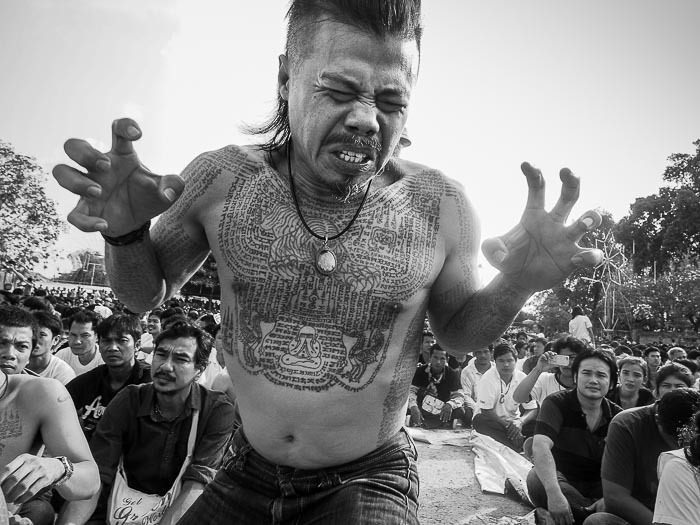 A man channels his spirit tattoo and charges the stage during the Wai Krua ceremony at Wat Bang Phra in Nakhon Pathom province. The annual tattoo festival at Wat Bang Phra, in Nakhon Pathom was yesterday. It's the one day of the year that I can reliably be counted on to work in black and white. 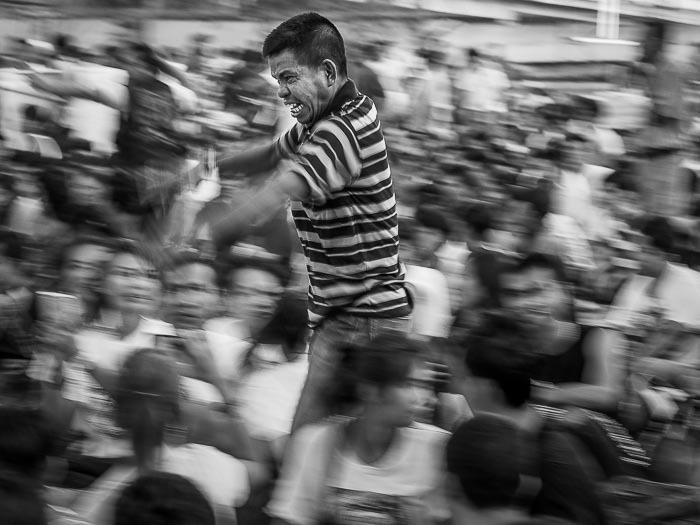 There's something about the faces, the graphics and the subject matter that I find myself covering it in monochrome. A monk is tattooed Friday evening at Wat Bang Phra. The tattoo blessing is frequently called a "festival" but it's not a tattoo festival in the U.S. sense of the word. 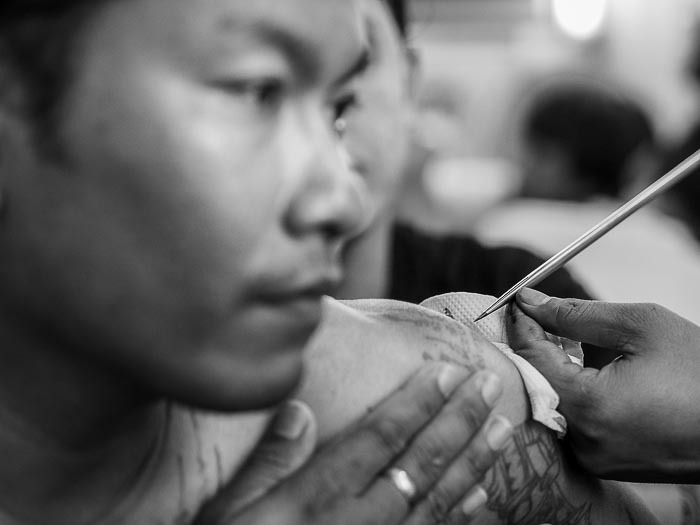 People come to Wat Bang Phra to get their tattoos blessed, to unlock the tattoo's spiritual power. Tattoo masters, either monks or deeply religious lay people, give people tattoos or freshen up existing tattoos. All of the work is done by hand with long stainless steel needles. 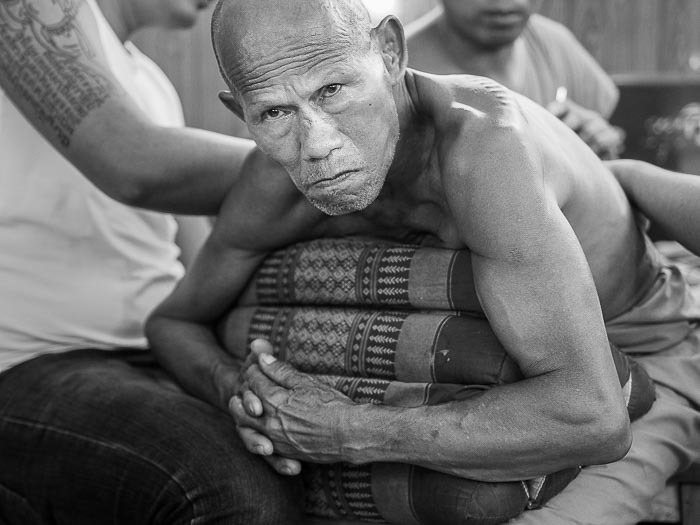 A man is tattooed at Wat Bang Phra. After the tattoo is completed, the monk (or tattoo master) pray with the tattoo recipient. Sometimes the recipient goes into a trance and unleashes the tattoos mystical powers. He (it's almost always a man, although women are frequently tattooed they don't go into the trances very often) will start growling and howling, punching the air with his fists while his friends rub his ears and bring him gently out of the trance. A man channels the power of his tattoo while the tattoo master prays with him. On Saturday, there's a large blessing ceremony. 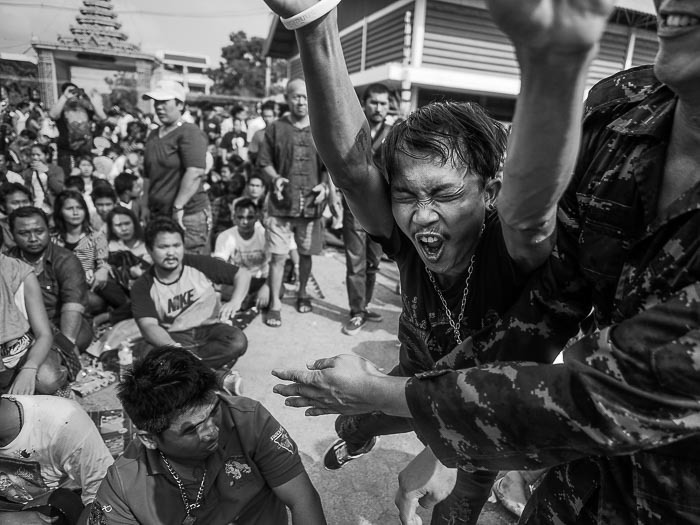 Thousands of people, many of whom have sacred Sak Yant tattoos gather in the parking lot for the ceremony which usually starts about 9:30AM. The exact time is selected by the abbot of the temple in the days before the ceremony. It's sometimes 9:09 or 9:19 or 9:39. 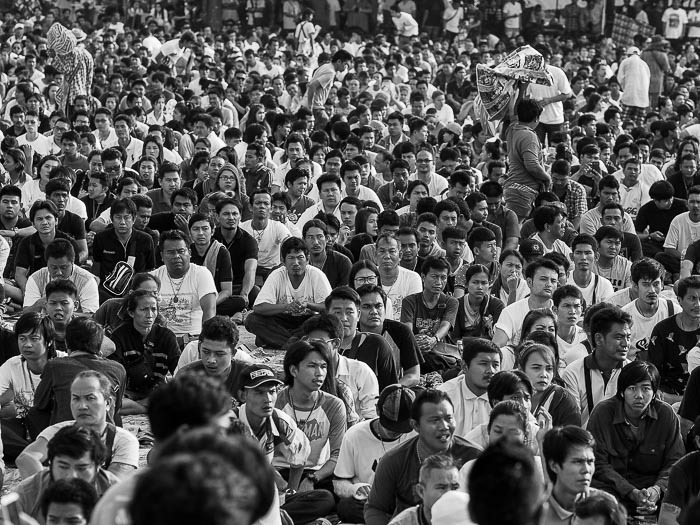 A part of the crowd in the parking lot at Wat Bang Phra. Throughout the morning men (usually) rise up, channeling the spirit of their tattoo. If it's a tiger, he becomes a tiger and rushes the stage. If it's a snake, he crawls to the stage. If it's a monkey, he starts chattering like a monkey and runs to the stage with simian like moves. In years of going to Wat Bang Phra, I've only seen a few women go into trances and rush the stage. A man rushes the stage, channeling the power of his tattoo. Soldiers stop a man rushing the stage and bring him out of his trance. I've been going out to Wat Bang Phra on Friday afternoon before the festival. I photograph people getting tattoos Friday afternoon and evening, the temple fair, which has trampolines and bouncy houses for the kids, street food, movies and arcade games. It's Wat Bang Phra's main fund raising event each year. Around 1AM Saturday, I find a park bench at the temple, or an empty spot on the floor, and try to get a couple of hours sleep. I usually get up about 4.30AM and start photographing again. By then people are already arriving for the ceremony. They go to different prayer halls at the temple to make merit. Monks do blessings and people are still getting tattoos. Friday and Saturday at the tattoo ceremony are a very long day. 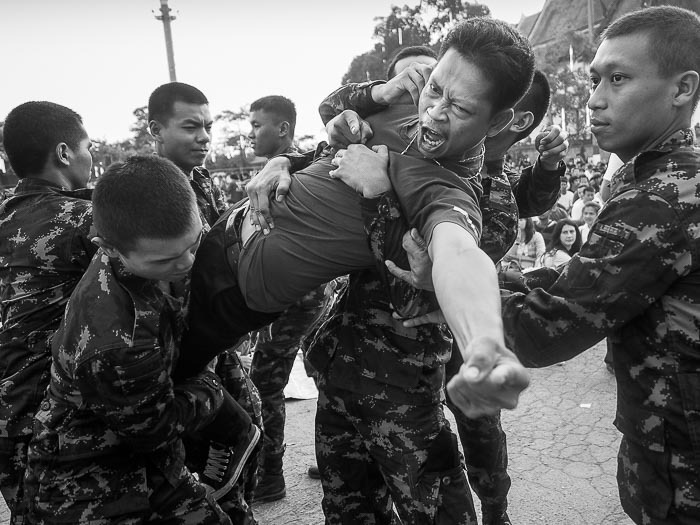 A man is caught by a soldier while he rushes the stage. I don't know if I'm going to Wat Bang Phra next year. It's becoming harder and harder to work at the ceremony. There's no crowd control, but the problem isn't the people who are charging the stage. It's the tourists and gawkers who wander around trying to photograph with iPhones and iPads and pay no attention to where they are or what's going on around them. They're a danger to themselves and the people around them. Photographing the tattoo ceremony requires a lot of situational awareness and the tourists who wander in have hardly any. There are more photos of the 2015 tattoo ceremony in my archive (including many in color) and available from ZUMA Press.